'Vampire Facial' Becomes Actual Horror As N.M. Spa Clients Face HIV Testing After a client of an Albuquerque spa developed an infection, health officials conducted an inspection and urged others who received needle treatments to get tested for blood-borne diseases. File photo shows a patient receiving a "vampire facial" whereby platelet-rich plasma is isolated from the blood and then re-injected into the face. The vampire facial was only supposed to sound scary. Sure, it involves extracting the patient's own blood, isolating the platelet-rich plasma by spinning it in a centrifuge and then re-injecting it into the face. But the results are touted to be rejuvenated, smooth and supple skin, not an HIV or hepatitis scare, as clients of the VIP Spa in Albuquerque, N.M., are now facing. 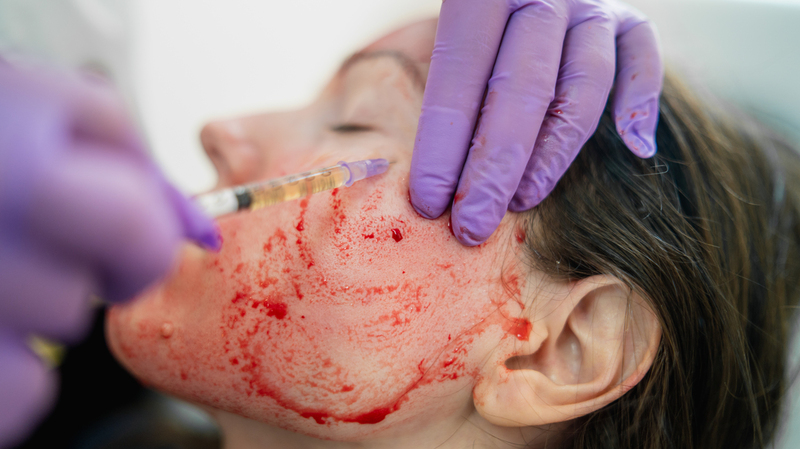 Health officials say those who received the vampire facial there — or any other type of injection-related service — at the spa between May and June 2018 were potentially put at risk of contracting a blood-borne disease. The New Mexico Department of Health is urging them to come for free HIV, hepatitis B and hepatitis C testing as well as free counseling. The department was tipped off after a spa client "developed an infection that may have resulted from a procedure performed by the VIP Spa." Health and state regulatory officials performed an inspection and found problems with needle storage, handling and disposal. A health department spokesman told NPR while it is still early in the investigation, no other infections have been identified. KOAT-TV reports the New Mexico Regulation and Licensing Department said spa owner Luly Ruiz was not licensed to perform the procedure because she is not a medical professional. Ruiz defended her use of the treatment, saying she only uses disposable needles. "I open them in front of my clients every time they come," Ruiz told the Albuquerque station. She added that she is cooperating with state officials and encourages clients who are worried to get tested. "I want everybody to be sure, everybody to be happy and to know they don't have anything," Ruiz told the station. For now, the New Mexico Regulation and Licensing Department has shut down the facility while an investigation is ongoing. A hearing is scheduled Friday in the case. Vampire facials have been growing in popularity, thanks in part to selfie-happy celebrities touting their benefits. Dr. Joshua Zeichner, assistant professor of dermatology at New York's Mount Sinai Hospital writes that "the platelet-rich plasma contains growth factors that have been purported to stimulate the growth of collagen and healthy skin cells." He adds that the procedure is safe even though pain and bruising may occur. Doctors, especially in sports medicine, have also used the treatment — known as platelet-rich plasma therapy — in a bid to soothe inflamed tissue and help injuries recover faster. The American Academy of Orthopaedic Surgeons says lab studies show "the increased concentration of growth factors in PRP can potentially speed up the healing process."